In recent years, it has been generally recognized that the major reason for most social, economic, cultural, educational, and environmental problems is the exclusion of a group of people from society. This is evident in Lebanon where obviously not all social groups are offered equal opportunities especially when it comes to educational and cultural activities. The aim of this program is to harvest the extensive experience of VAPA in offering workshops by directing it towards a social cause. We wish to offer workshops to everyone and not just the ones able to pay or the ones targeted by an international aid fund. With the help of income coming from the normal workshops we offer, we will be able to provide a learning opportunity to people who lack it. Paying participants in the workshops will have the option to pay 25% more of the normal workshop fee and finance, along with VAPA, the expenses of a participant who is not able to pay. VAPA and the trainer will donate the remaining 75% of the workshop fee. Our program goes beyond the simple idea of offering free workshops to needy people. We believe sustainability is in our internal culture, and therefore always look to the future in every action we take. At the end of the workshops, all the participants’ artwork will be exhibited and sold in an attempt to finance the art equipment needed by the participants who have no means to buy them and wish to follow the skills they have acquired. We will offer socially excluded people the opportunity to acquire a new skill, the equipment to pursue it, and the contacts to make it or integrate it into their original profession. Along with the above intentions, an indirect goal of our program is to create a safe environment in which diverse groups of our society can meet and interact: from doctors to released inmates, from architects to shoe makers, from lawyers to homeless people…All coming from the different regions and religious groups in Lebanon. Finally we would like to assure you that all the beneficiaries of the program are selected according to objective and non discriminating criteria…as not to promote further social exclusion. The Summer Workshop schedule for Roof 68 is here! Ground Floor – AL Shami Building – St. Louis St.
Y-PEER? It sounds familiar and interesting… But what is it? 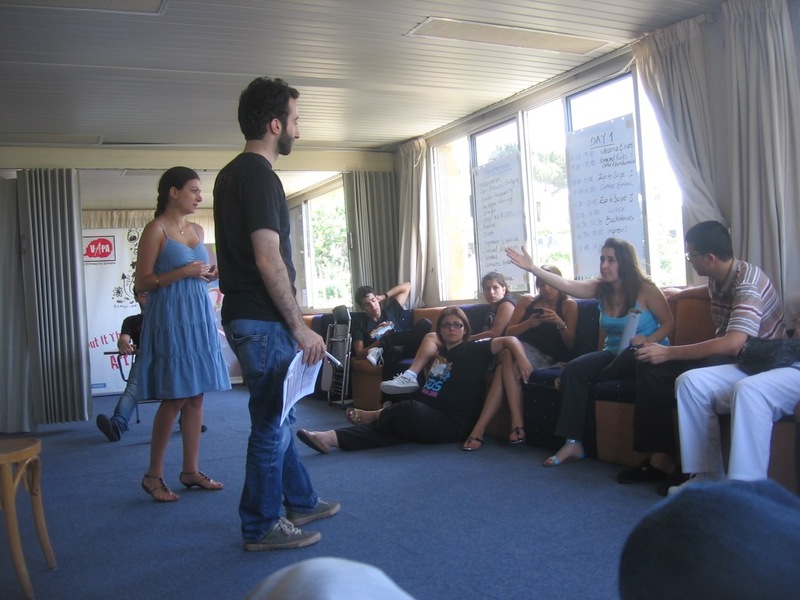 Under the Y-PEER program established in 2008 and supported by UNFPA (United Nations Population Fund) Lebanon, several activities and interventions have been developed and implemented by the Y-PEER network aiming at raising awareness of young people on HIV/AIDS, developing capacities of young people and NGOs in peer to peer education, conducting advocacy events for promoting healthy and responsible behaviors among young people, developing and using interactive and creative approaches as well as visibility tools to be used in the various activities. With the aim of expanding the network to the school sector, TBPE (Theater Based Peer Education) will be introduced in 3 schools on a pilot basis tapping on the expertise of VAPA (Visual and Performing Arts Association). The theatre director and co-founder of VAPA, Lucien Bourjeily was approached by UNFPA to attend a master TBPE TOT in Alexandria, Egypt between the 5th and the 11th of April along with two actors from his theatrical troop where they were all exposed to all the different elements of the TBPE approach. Mr. Bourjeily got further exposure to the TBPE approach in New York where his capacities in facilitation were developed during the month of June while conducting a study tour with Nite Star, a global Y-PEER organization partner. UNFPA approached VAPA after a thorough assessment to select a theatrical institution to lead an initiative in TBPE in schools as part of its Y-PEER project. This initiative focuses on using theater techniques to raise awareness on sexual and reproductive health (SRH) topics including HIV/AIDS. These techniques are based on an interactive approach where the audience becomes an active participant in the scenes and their content. Here are some photos of the 4 day TBPE Training of Trainers we gave in Kfardebian!